Integrated circuit (IC) chip technology has changed our world and is now considered an ordinary part of modern life. Yet, the facilities in which semiconductors and advanced electronics are produced are anything but “ordinary.” For these cutting-edge operations, only the most innovative finishes will do— and that includes RC Corrocare’s conductive flooring systems for electronics and semiconductors. 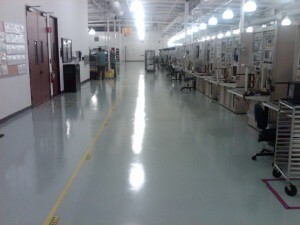 Whether a semiconductor fabrication plant (fab) or foundry, an integrated circuit contractor or an electronic component manufacturer, safety is priority number one—and RC Corrocare’s ESD flooring can help.